My lab is using an EyeTribe eye tracker with OpenSesame and we have been getting the following error after calibration in an unpredictable manner. We have had the error before and after updating to OpenSesame 3.2.5. This error means that the Python interpreter itself crashes (rather than a Python script that crashes within the Python interpreter). This always reflects a bug somewhere in the underlying libraries, and is very difficult to debug. What happens exactly? Does the OpenSesame user interface crash as well? If so, then you can try switching to the multiprocess runner (under Menu → Tools → Preferences). Or are you already using the multiprocess runner, and is only the experiment crashing? Thanks for your help, Sebastiaan. We've been using the multiprocess runner. 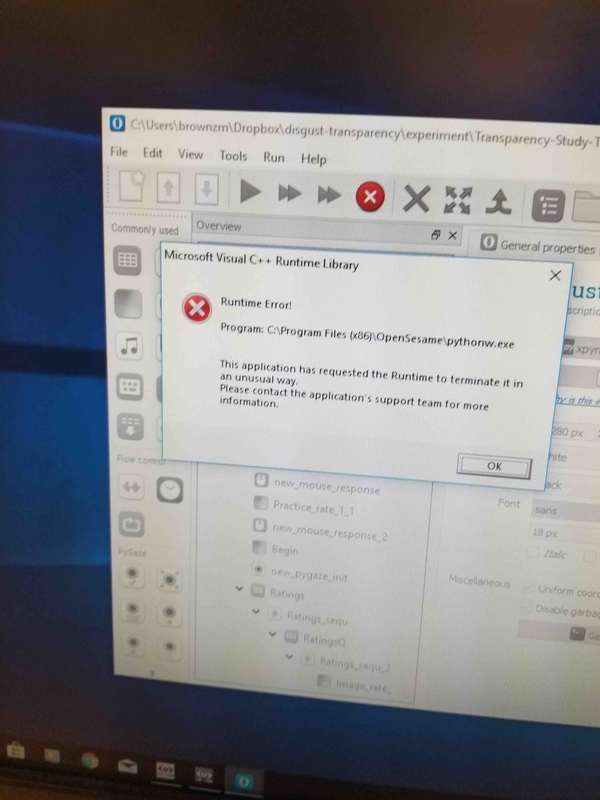 The OpenSesame experiment crashes, but the entire program doesn't--it goes back to the user interface screen with the error message. Also, it happens to us about 50% of the time. Please let me know if I can provide more information. Here is a grainy picture of the monitor after the error occurs. 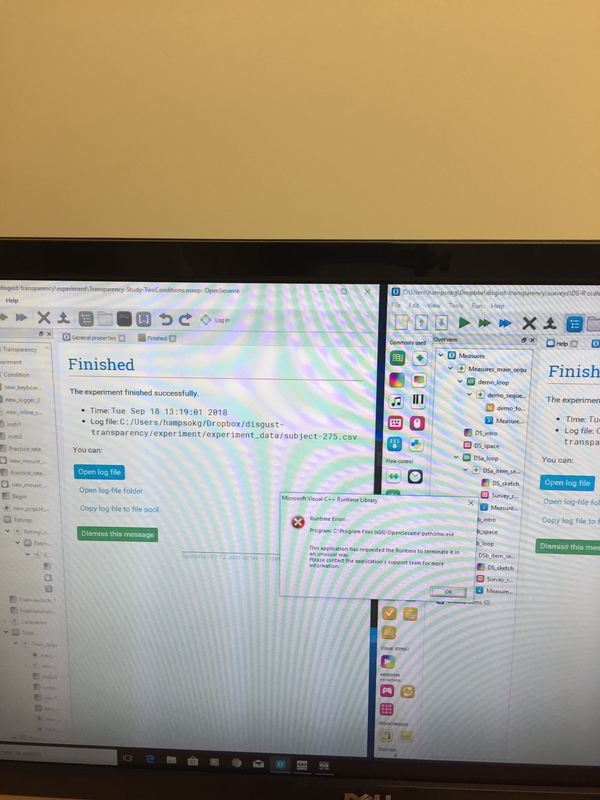 Also, after this happened, I asked the research assistant to close the OpenSesame file for the surveys that precede the experiment (window on the right) before running the experiment (window on the left). Do you mean that the survey experiment also crashes? Or that the crash still persists in the eye-tracking experiment even when the survey is removed? 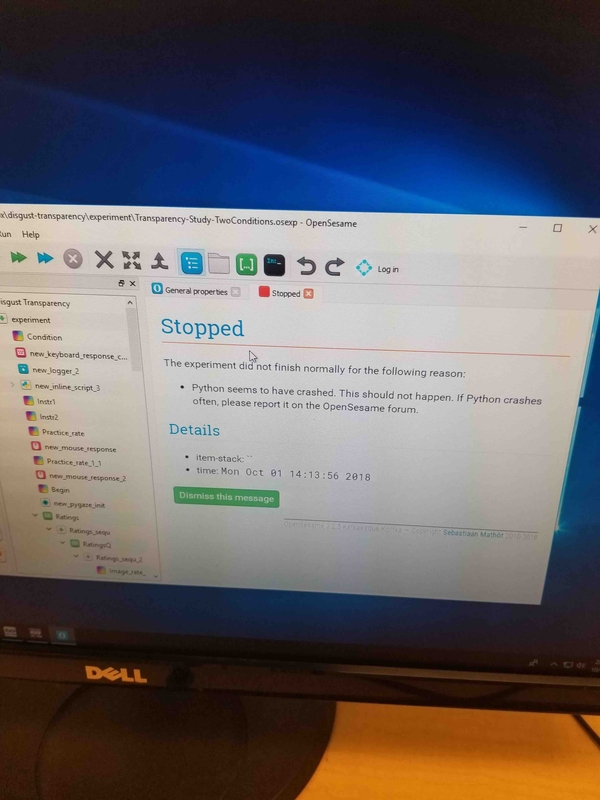 If OpenSesame says that the experiment finished successfully, this means that the Python interpreter crashed at the very last moment, after the experiment told the user interface that it finished successfully, but before the process really shut down. Practically speaking, things are fine then. In general, it sounds like a messy situation. I would be pragmatic and decide whether the crashes prevent the experiment from running smoothly. For example, if the experiment always crashes during calibration, then you can restart until it works, and that might be (barely) acceptable. But if the experiment randomly crashes midway, then I would not consider this acceptable, and look for an alternative solution. Thanks for the reply and pardon the delay. The surveys do not crash--I was just concerned that having a second experiment file open while running another might be the issue, but it does not appear to be related. I have implemented a practical solution like the one you suggested (I dropped the midpoint calibration, and I have programmed the study so that you can start up from calibration and skip earlier objects after a crash)--an acceptable solution for now, I think. We would like a more longterm solution though, as the same error is happening in a couple of experiments in our lab with some frequency. You mentioned that it was nearly impossible to debug. Is there a way to reinstall the libraries that might be causing the bug? Also, we were going to switch to a newer machine and from the Eye Tribe to the Gazepoint after these studies are completed. Although I'm reluctant to switch mid-study, do you think either solution might have a decent shot at addressing the bug? Reinstalling is unlikely to help, but upgrading is. The problem of course is figuring out which libraries to upgrade. Likely candidates are pygame and pyopengl (for legacy and xpyriment) and pyglet (for psychopy). Thanks for the advice! I'll give it a shot.